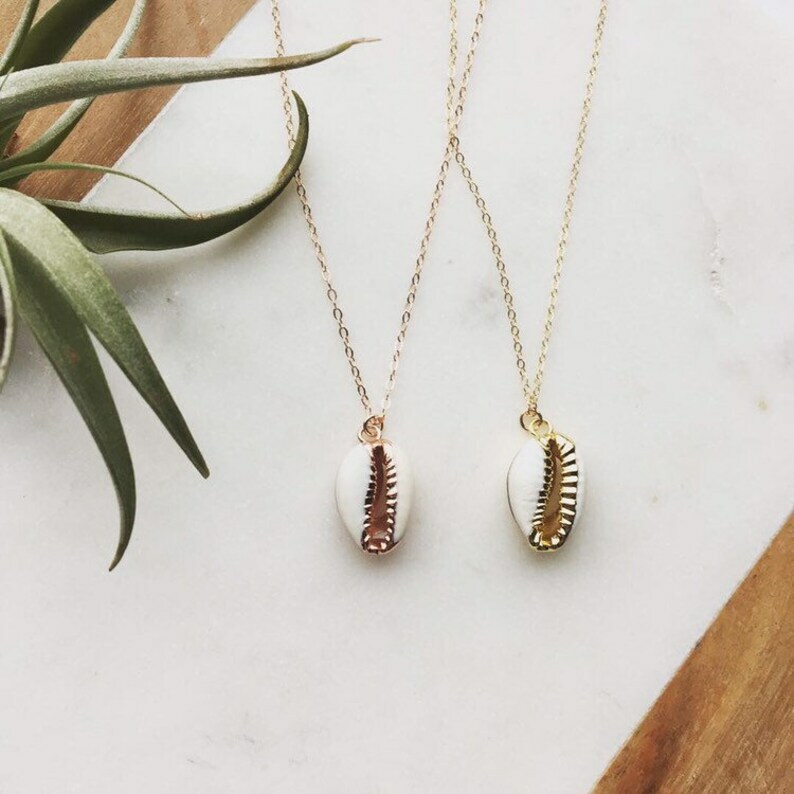 A real natural cowrie shell dipped in gold or rose gold for the perfect pretty bohemian necklace. This necklace would look amazing layered. ♡ QUESTIONS? Send me a convo by clicking "contact the shop owner" below this listing. My name is Leslie, and I love to answer your questions and accommodate requests! ♡ PACKAGING: All orders come with a cotton drawstring bag, perfect for gift-giving! All designs and content, rights reserved © 2019 Lemon Sweet Jewelry LLC. Very pretty, but a little challenging to put on. I accept Paypal and credit cards through Etsy's direct checkout system. Orders purchased via e-check will only be shipped after the e-check clears, which can take several days. Please note: Washington orders will include sales tax. All items are final sale unless a mistake has been made by me. If you are not satisfied with your item, you may exchange it for something else in the shop. Happy customers are important to me so I will do my best to make you happy. Shipping fees will not be refunded. Return shipping is the buyer's responsibility. * Earrings are always final sale, no exchanges or refunds are given on these items for sanitary reasons. I work hard to ship out your orders quickly. Orders take 4-6 business days to handcraft, this does not include shipping time. Your purchase will be mailed to your --ETSY-- mailing address. Please make sure your Etsy address is accurate and "safe" to receive items. Please note: customs fees are customers responsibility. Combined shipping is offered for multiple item purchases. I cannot responsible for lost or stolen packages. If you would like to have your package INSURED, or you would like to add TRACKING please contact me, and I will add the cost of insurance/tracking to your shipping costs. Please understand that leaving negative feedback really impacts my business and my shop. Your satisfaction is very important to me. I wish to make all transactions positive for both parties, so if you are not happy with your order for ANY reason please let me know before leaving feedback and we will work out a solution. All packages are sent with my custom packaging, either on one of my custom jewelry cards or in a small hand stamped box. Orders take 4-6 business days to handcraft, this does not include shipping time. Please contact me if you need something shipped sooner. Once in a while, shipping will be delayed, if that is the case I will contact you and upgrade your shipping to priority for the inconvenience. Send me a note if you would like a custom order. I love working with my customers to create their vision! * Items are handmade, and should be handled as such. Always use care when taking items on/off. Please do not wear while exercising, swimming or showering. Jewelry needs to be properly cleaned, so please keep clean and dry when not in use and store in a safe place. Wash with care and be careful not to tangle chain. Sterling silver and gold-filled components can last years of regular wear if taken care of properly. Also, I do not recommend wearing your jewelry while sleeping as it causes unnecessary wear and tear. Be careful not to snag your jewelry or put excessive pressure on the piece. To clean gently rub with a baking soda & water paste; toothpaste & water; or jewelry cleaner, and rinse with water. To clean gently rub with dish wash liquid & water, or jewelry cleaner, then rinse with water. Important: Do not expose 14k gold fill jewelry to chlorine (commonly in pools, hut tubs, etc). The chlorine will cause a chemical reaction that will discolor and begin deterioration of the piece. Avoid harsh chemicals and cleaning solutions. Brass color deepens over time. Brass, like silver will patina (tarnish) if not cleaned. This is just oxidation and can be cleaned off, but if you do not clean off tarnish in a timely manner, tarnish may remain permanently. To brighten simply rub with lemon & water then rinse. It can be handy to keep a mixture of lemon & water in a small spray bottle. Never scrub plated components. The life of jewelry made with these materials can be made to last significantly longer if cared for properly. Suggested care tips: wash gently with dish washer liquid + water; remove before exercising or showering; store in a clean and dry place, preferably a closed container; always handle with care, especially when taking on and off. Please contact me if you are interested in carrying Lemon Sweet Jewelry in your shop!